The U.S. military is investigating 16 private American security guards for shooting at U.S. Marines and Iraqi civilians during a three-hour spree last month west of Baghdad, officials said Thursday. The Marines said the 16 Americans and three Iraqi contractors sprayed small-arms fire at Iraqi civilians and U.S. forces from their cars in Fallujah on May 28. There were no casualties. Marines spokesman Lt. Col. Dave Lapan said Marines reported seeing gunmen in several late-model trucks fire "near civilian cars" and on military positions. "Three hours later, another Marine observation post was fired on by gunmen from vehicles matching the description of those involved in the earlier attack," Lapan said. U.S. forces later detained the contractors without incident and held them for three days in a military jail, but no charges have been filed. The American contractors are believed to have left Iraq, and a Naval Criminal Investigative Service inquiry is under way, the military said. Iraq's rampant insecurity has spawned a thriving private industry comprising Iraqis and former military personnel from around the world to protect foreign contractors working on reconstruction projects, journalists and senior government officials and diplomats. Many Iraqis resent high-profile security details who speed along highways in sport utility vehicles brandishing automatic weapons. Senior government officials, who are prime targets of militants wreaking havoc across Iraq, use private security firms. Insurgents on Thursday ambushed a convoy carrying U.S. supplies near Khaldiyah, 75 miles west of Baghdad, police Sgt. Shakir Ibrahim said. Several trucks and SUVs were destroyed and there were an unspecified number of casualties. The attack was the second against a convoy transporting goods for American forces this week west of Baghdad. U.S. officials confirmed last week's arrest of Mullah Mahdi, Mosul cell leader of the feared Ansar al-Sunnah terror group, which has links to al Qaeda in Iraq. Iraqi and American forces also have captured numerous foreign fighters from Syria, Jordan, Saudi Arabia and Morocco. Two Mahdi aides were captured Wednesday in Mosul, said Asso Mamand, an official of the Patriotic Union of Kurdistan. 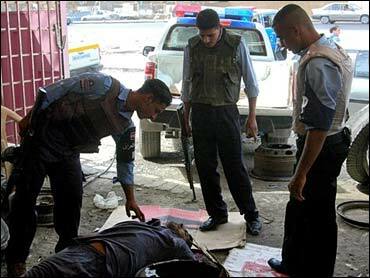 Gunmen killed former Baath Party member Kamil al-Nouri near his grocery store in Baghdad's impoverished Sadr City late Wednesday, police Maj. Hussein Jadou'a said. Al-Nouri was one of 10 Iraqis announced killed Wednesday across the country. British Foreign Minister Jack Straw and a high-level European Union delegation visited Baghdad, and Straw called on Europe to put aside its divisions over the Iraq war and help the country rebuild. "Yes, the Iraq war did divide Europe," Straw said. "Now there is a new spirit around to put the past behind us to work for this new future for Iraq." The EU trip came ahead of a June 22 international conference on Iraq that will be held in Belgium. More than 80 countries and international organizations have been invited to the one-day session. Secretary of State Condoleezza Rice was also expected to attend. President Jalal Talabani said up to 25 Sunni Muslim Arabs will be appointed to join elected lawmakers in drafting Iraq's new constitution, averting a threatened Sunni boycott of the process if they did not receive greater representation. Meanwhile, the United States is talking with Sunni Arab leaders with ties to militant groups to try to get them to lay down their arms, an American official said. Several groups are indicating a willingness to join the political process, but more radical militants can only be dealt with by military means, he said. "In order to achieve stability and an end to the insurgency and stop Iraqis from being killed in large numbers, the insurgency has to be addressed," the Baghdad-based official said Wednesday during a briefing on condition he not be identified. Talabani's announcement was a victory for Iraq's Sunni Arabs, whose support is crucial for Iraq's Shiite- and Kurdish-dominated government, particularly to approve the constitution. The draft charter will collapse if three of Iraq's four predominantly Sunni Arab provinces vote against it in a referendum later this year. "We have decided to add about 20 to 25 members from Sunnis in the committee, which will draft the constitution with full rights like other members who were elected by the parliament," Talabani said. Two Sunni Arab lawmakers sit on a 55-member parliamentary committee drafting the charter, but Sunni Arabs felt this was too small a representation. The Shiite-led government offered 13 extra places for Sunni Arabs from outside the parliament to help the 55-member committee draw up the constitution. No voting rights were offered to the 13, however, but the committee said it would make all decisions by consensus. On Wednesday, however, Iraq's largest Sunni Arab organizations, the Iraqi Islamic Party and the Sunni Endowment, rejected the offer of 13, and instead demanded 25 seats with the same voting rights as the others. It was unclear if Talabani's announcement meant any new Sunni Arab members would have the same voting rights as the original 55 lawmakers who were selected to the parliamentary constitutional-drafting committee. The constitution must be drafted by mid-August and approved two months later in a referendum. Sunni Arab approval is needed for the charter to take effect and new elections to be held in December.